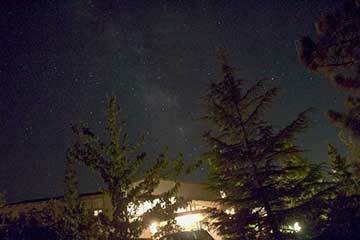 Hey, we finally had a clear night for observing. It was about time too because I was reaching the end of my tether and with a busy schedule this was the only night we were going to get until mid June. I'm currently in Pasadena for a weekend conference "In the year 2525: Big Science, Big History and the far future of humanity". It should be great. You old folks probably remember the song, by the same title, which was a big hit when I was in college. We'll see how these two visions differ. some of the old familiar winter constellations again just a little bit earlier. I guess astronomer assistant, Danny, will be in charge while we are gone. Actually he will probably be spending some vacation time with Bob, so the other Astronomer Assistant, Willow, will be mostly in charge. She has a good disposition for an astronomer because she mostly sleeps all day and then roams around or does who knows what at night. Before we get back to astro photos I wanted to share a short two minute video showing our cruise ship. It looks like a lot of fun. My main issue with the video was that the presenter described how well the bar was constructed and the fine wood etc, but skipped over the rows of martini glasses that I hope will welcome us on our arrival. Oh, well, we will just have to see. Everyone I meet who has been on that cruise say it is fantastic and that we should have a good time. I hope so. Now, how about those Astro images? I took the scope outside and aligned the new red dot finder scope on Venus. Wow, that red dot finder is really easy to use and it's what I'm used to using and I feel much more in control now. The first image is of Jupiter with four visible moons. I couldn't make out much of Jupiter band structure and will need to go to higher magnification to see much of that. I can get more magnification with my 2x and 5x Barlow lenses, but I haven't quite got the interfaces arranged for my camera to fit together with those lenses. Next, the moon was up and quite close to Jupiter, so that was fun looking at all the surface features. The next two images are of Saturn. Wow, that planet is just a bit smaller than Jupiter, but is almost twice as far away, that it's hard to get much detail. I'll have to try again when I get the Barlows figured out. I knew how to use the Barlows with my old scope, but this new one has some other adapters that complicate the focusing. the large moon Titan. Saturn has many moon, some like Titan, that are in the same orbital plane as the rings and other moons that were probably captured later, not formed at the same time as Saturn, and are found in wilder inclinations and eccentricities. Maybe this is the time for some homework? I'm busy boning up for the final exam for Mike Browns class on the solar system, so how about if you elect to find out what the orientation of Saturn's moons would have been and see how many of the objects in the photo are moons. The second homework question concerns the asteroid Ceres and the Dawn mission that is just getting ready to go into orbit around it. Is Ceres visible to the amateur with a small telescope? Yes, folks tell me that it is. My calculations indicate that Ceres is about 1/4 the diameter of any one of the large Jupiter moons, but is only 1/2 as far away. So to me, Ceres should show up at about 1/2 the size of any of the four large Jupiter moons. I think that means it will probably just show up as a couple of camera pixels at least. What say you?